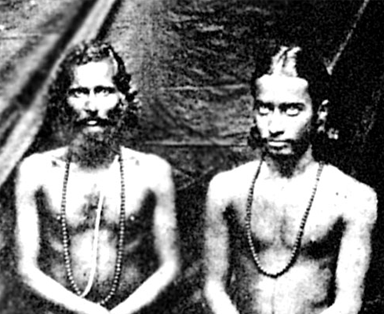 Swami Kebalananda, Paramhansa Yogananda’s tutor, meditating with a young Paramhansa Yogananda. Rarely fortunate, I was able to remain near Lahiri Mahasaya for ten years. His Benares home was my nightly goal of pilgrimage. The guru was always present in a small front parlor on the first floor. As he sat in lotus posture on a backless wooden seat, his disciples garlanded him in a semicircle. His eyes sparkled and danced with the joy of the Divine. They were ever half closed, peering through the inner telescopic orb into a sphere of eternal bliss. He seldom spoke at length. Occasionally his gaze would focus on a student in need of help; healing words poured then like an avalanche of light. An indescribable peace blossomed within me at the master’s glance. I was permeated with his fragrance, as though from a lotus of infinity. To be with him, even without exchanging a word for days, was experience which changed my entire being. If any invisible barrier rose in the path of my concentration, I would meditate at the guru’s feet. There the most tenuous states came easily within my grasp. Such perceptions eluded me in the presence of lesser teachers. The master was a living temple of God whose secret doors were open to all disciples through devotion. Lahiri Mahasaya was no bookish interpreter of the scriptures. Effortlessly he dipped into the ‘divine library.’ Foam of words and spray of thoughts gushed from the fountain of his omniscience. He had the wondrous clavis which unlocked the profound philosophical science embedded ages ago in the Vedas.6 If asked to explain the different planes of consciousness mentioned in the ancient texts, he would smilingly assent. “I will undergo those states, and presently tell you what I perceive.” He was thus diametrically unlike the teachers who commit scripture to memory and then give forth unrealized abstractions. “Please expound the holy stanzas as the meaning occurs to you.” The taciturn guru often gave this instruction to a near-by disciple. “I will guide your thoughts, that the right interpretation be uttered.” In this way many of Lahiri Mahasaya’s perceptions came to be recorded, with voluminous commentaries by various students. No matter what the disciple’s problem, the guru advised Kriya Yoga for its solution. I myself consider Kriya the most effective device of salvation through self-effort ever to be evolved in man’s search for the Infinite. Through its use, the omnipotent God, hidden in all men, became visibly incarnated in the flesh of Lahiri Mahasaya and a number of his disciples.